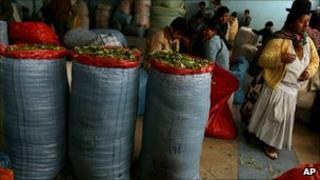 Bolivia has launched a diplomatic offensive to try to end an international ban on chewing coca leaf. Foreign Minister David Choquehuanca is on a European tour in a bid to drum up support to amend a UN treaty on banned drugs to decriminalise coca chewing. Coca has been used in the Andes for thousands of years as a mild stimulant and sacred herbal medicine. But it is also the raw material for the production of illegal cocaine, and the US is expected to oppose the move. Bolivia wants to amend the 1961 UN Single Convention on Narcotics Drugs to remove language that bans the chewing of coca leaf. The convention stipulates that coca-chewing be eliminated within 25 years of the convention coming into effect in 1964. Bolivia says that is discriminatory, given that coca use is so deeply rooted in the indigenous culture of the Andes. How can it be possible that the coca leaf, that is the symbol of our identity, is penalised? Its proposal would leave in place language that makes coca a controlled substance. Spain has already given its support to the Bolivian campaign. Spanish foreign minister Trinidad Jimenez told Mr Choquehuanca in Madrid that she "understood" Bolivia's demand and would try to mediate with other European countries thought to be considering an objection. Two countries which had recently filed objections - Colombia and Macedonia - have withdrawn them after Bolivian lobbying. But on Thursday, the US sent a letter to the United Nations saying it was opposed to the move. An unnamed state department official told the AFP news agency the proposed amendment "would have introduced ambiguity to the scope of controls on coca leaf". The US, the world's largest consumer of cocaine, has been leading efforts to eradicate coca production in the Andes for decades. The official said removing all references to coca leaf chewing from the convention would weaken the counter-narcotics fight. The US hopes other countries will follow suit and also register their opposition. The deadline for objections is 31 January. Bolivian President Evo Morales has long advocated the recognition of coca as a plant of great medicinal, cultural and religious importance that is distinct from cocaine. As well as being Bolivia's first indigenous head of state, Mr Morales is also a leader of a coca-growers trade union. "How can it be possible that the coca leaf, that is the symbol of our identity, which is ancestral, is penalised?" he asked reporters on Friday before despatching Mr Choquehuanca on his diplomatic tour. On Tuesday Bolivia launched the latest product aimed at industrialising coca leaf and providing a market for growers so their crops do not end up being made into illegal cocaine. A Bolivian company launched Coca Brynco, a fizzy soft drink made with coca leaf extract. The manufacturers hope it will challenge the market share of another fizzy drink originally flavoured with coca - the American classic, Coca-Cola.